The Makhel and Makhi Mitchell have reclassified into the Class of 2019. Next year they will attend Paul Charter Middle School in Washington, DC as well as rocking for the DC Blue Devils once again. This move will definitely have an impact on this class regionally and maybe nationally. The twins AAU Coach John Perry agrees with the Mitchell brother’s move. “By re-classifying this allows them to mature in the classroom and on the floor. As their coach, I feel they will continue to improve their game as long as they love doing what it takes to get better including the offseason workout” he finished. 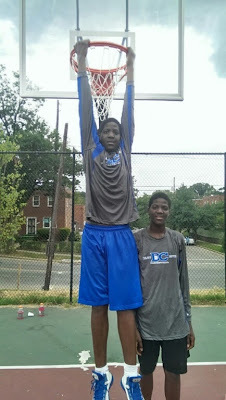 Basketball Spotlight will keep an eye on the Mitchell twins and their progress the next few years.